Home to the second largest barrier reef in the world, Belize is known for its jungle and its diving. In this travel vlog from adventure travel YouTuber Fearless and Far, it’s easy to see why it’s on the hit list of many divers! Our video wall is sponsored by SeaLife, and each week we’ll be posting a video either from SeaLife or a guest video picked from our user-generated uploads showcasing the best of diving, conservation, travel and more! 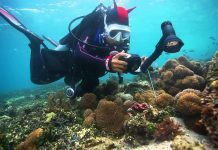 SeaLife has been around since the early ‘90’s and are the first company to make underwater photography accessible to the masses of recreational divers. SeaLife developed the first ever underwater digital camera in the year 2000 with its DC100 camera and have had a long history since up to their current flagship model, the DC2000. SeaLife cameras were developed by divers for divers and were the first cameras to include colour correcting underwater filtering “Land & Sea” modes in the camera’s firmware. 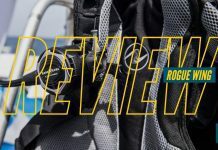 SeaLife’s footprint in diving extends far beyond cameras with their Sea Dragon underwater lighting for photo, video and as primary and back-up dive lights. 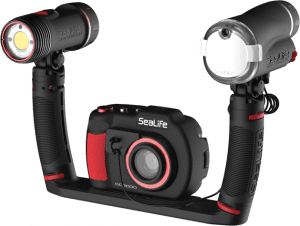 SeaLife’s popular Flex-Connect mounting system for cameras and lights is secure, ergonomic and comfortable, while being easy to set up and disassemble.